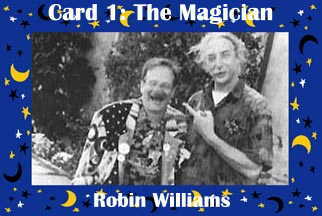 "Robin Williams and Patch Adams, 1997: A Matched Pair? Photo by Ben Stechschulte" Robin Williams as the Magician is a Level Two archetype: we believe this man can do anything, and do it with style, grace and glorious good humor. He is skilled, strong, complete, superb. The Hero's Journey is a life cycle from Fool to Magician. It is Dorothy in the Wizard of Oz; it is Luke Skywalker, going from farmboy to Jedi Knight. Everyone starts out a Fool, but not everyone manages to become a Magician. Once you do become a magician, you start the journey all over again, this time at a higher level. Robin and Patch pic ruthlessly swiped from The Gesundheit! Institute's Rip Roarin' Home Page!.